New Saint Andrews College (http://www.nsa.edu) is a classical Christian liberal arts college. 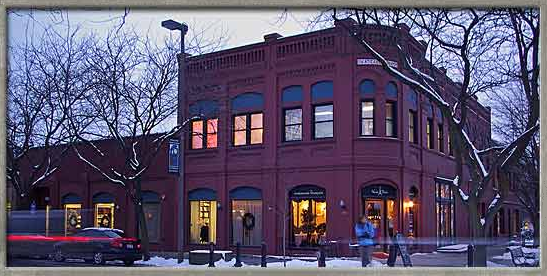 The small college is located in the restored 1891 Skattaboe building on historic downtown Main Street in Moscow, Idaho. New Saint Andrews began with four students in the fall of 1994 and graduated its first two students in 1998. Today there are about 180 students enrolled in the college. The mission of New Saint Andrews is to graduate leaders who shape culture, living faithfully under the lordship of Jesus Christ. The college is affiliated with the Reformed Evangelical Church. New Saint Andrews College is a close-knit community of leading Christian scholar-teachers and a select number of students from diverse church backgrounds. The college follows a single, integrated classical liberal arts curriculum from a Christian worldview. The college offers Associate and Bachelor degrees in Liberal Arts and Culture, a Master of Arts in Theology and Letters, a Master of Studies in Classical Christian Studies, and a 16-credit online Graduate Certificate in Classical Christian Studies. The school’s intellectually challenging curriculum is modeled after the Harvard curriculum of the seventeenth century. Rather than using textbooks, the college emphasizes reading of primary works in classical and Christian literature. Besides reading the Great Books of Western civilization, students study the ancient languages of Latin, Greek, and Hebrew. Also required are courses in natural philosophy (mostly taxonomy and creationist science), Euclidean geometry, theology, and public speaking. The college conducts “Oxford-style” small group recitations, in which six to eight students meet with individual faculty members to discuss the assigned readings. Students have examinations every eight weeks, many of which are conducted orally. Seniors are required to write theses and defend them before a faculty panel. Short evaluations are given in addition to a system of Latin letter grades. The student-to-faculty ratio at New Saint Andrews College is 11:1. The board, faculty, and staff are all Reformed Evangelical Christians who inspire their students to excellence and are always there if you need them. The graduate faculty includes ten Senior Fellows or Fellows who hold the highest degree in their field or are completing the doctorate. The faculty includes Dr. Gordon Wilson, Douglas Wilson, and N.D. Wilson – two brothers and a son! Douglas Wilson, one of the founders of New Saint Andrews College, has long been a prominent advocate for classical Christian education. He authored several books including Recovering the Lost Tools of Learning and The Case for Classical Christian Education . In those writings, he argues that the American public schools are failing to educate their students, and he proposes a Christian approach to education based on the Trivium, a Greco-Roman approach to education which emphasizes grammar, rhetoric, and logic as well as a wide exposure to the liberal arts, including classical Western languages such as Latin and Greek. The model has been adopted by many Christian private schools and homeschoolers. Dr. Gordon Wilson, Senior Fellow of Natural History at New Saint Andrews, just published The Riot and the Dance: Foundational Biology . This new book is an approachable and readable explanation of the basics of biology for non-major college biology students and high school students. Using analogies, anecdotes, and simple, personable language, Dr. Wilson teaches students the bottom-line themes and key details of biology. With over 130 original illustrations and several hundred figures total, this book provides students with an integrated foundation for understanding biological life that will stir up curiosity about all life from fungus firearms to familiar vertebrates—along with a greater desire to praise the Creator of it all. Children’s fantasy author N.D. Wilson is a New Saint Andrews alumnus and Fellow of Literature. Much of his fictional writing is characterized by its creative allusions to classic literature. Wilson’s 100 Cupboards trilogy is the story of Henry York, a boy who finds his way to other worlds through the cupboards in the attic of his uncle’s Kansas house. Kirkus Reviews wrote, “Wilson’s writing is fantastical, but works with clever sentences and turns of phrase that render it more than just another rote fantasy.” Wilson received his Masters degree from Saint John’s College in Annapolis, Maryland. New Saint Andrews College limits new student enrollment to about 50-60 new undergraduates and 10-15 graduate students each year. The current student body comes from 30 states, five foreign countries (Canada, England, France, Ivory Coast, and Korea), and more than 20 different Christian denominations. About half of the college’s students were homeschooled and a quarter attended high schools affiliated with the Association of Classical and Christian Schools (ACCS). Everyone at New Saint Andrews is held to biblical standards in the way they conduct themselves. However, these standards are not oppressive to students. The students try to make everything they do fun and glorifying to God, whether it involves a party, sporting event, or study group. The rate of student retention at the college is 95%, which is well above average. Students probably love their stay here because they find their classmates to be so like-minded. They all come from Christian families committed to Christian education in either a classically-oriented homeschool experience or a private Christian high school. By the way, you may be interested to know that the school appears to be a “capable matchmaker,” as “during May and June student weddings occupy nearly every weekend” (Worthen p. 3). Approximately one-third of the college’s graduates pursue graduate school or advanced professional studies, one-third go on to teach at classical and Christian schools, and one-third pursue other callings or professions. A time-honored classical education is excellent intellectual and spiritual preparation for pursuing advanced studies and specialized training in particular fields or for positions of leadership and management. New Saint Andrews provides no dormitories or food services. Instead, it encourages students to live as responsible members of the local community. Students are encouraged to board with a family or rent a house/apartment, and the college assists students in arranging appropriate housing. If you board with a family they will often provide meals (usually dinners). There are also several food options within a couple blocks of the campus, from coffee shops to bakeries to fast foods to a natural food co-op. Moscow is a small but lively community with as many college students at the University of Idaho and nearby Washington State University as there are year-round residents. Combine that with the many large Christian churches in the area and you have the makings for lively debates and a diversity of opinions. It’s a great place to gain a classical liberal arts education and practice in engaging, shaping, and creating culture. New Saint Andrews is an intensely independent non-profit institution that does not accept any state or federal funding. The college offers grants and a couple of in-house scholarships, but you will have to pay the majority out of pocket. However, the $11,200 per year tuition is less than half the national average for a private college. Plus, students have the opportunity to lock in their rate for four consecutive years. Apply by February 15th for top scholarship consideration! The undergraduate application form asks about the type of secondary education completed (homeschool, institutional high school, GED) and what curriculum was used (Veritas Press, Canon Press, Logos Online School, Classical Conversations, etc.). The college also wants to know what church you attend and the denominational affiliation. You will need to list your extracurricular interests and activities, the last three books you’ve read, what style of music you listen to, your favorite three movies and why, as well as how many hours you spend reading, watching television, and playing electronic games. They also ask for the address of your Facebook page and any other online presence. So it’s obvious that they are looking for serious students of good character. The college specifically seeks students who have a balanced life combining academic interests, service to others, involvement in their church and local communities, and appreciation of humor and the arts. According to one source, New Saint Andrews College has an acceptance rate of 86%. Recent data shows that of 73 applications submitted, 63 were accepted, so if you are serious about attending it doesn’t sound too difficult to get in as long as you are committed to sound doctrine, personal holiness, cultural reformation, and academic integrity. The college will consider accepting your dual enrollment credits and advanced placement credits if you have any. Interested students are invited to join the faculty and students of New Saint Andrews from March 27-30, 2015 (during the Grace Agenda Conference) for a Prospective Student Event. During your visit, you can meet current students, speak with professors, sit in on classes, and experience the college community. To register for your campus visit—during a Prospective Student Weekend or anytime—click here. To speak directly to an admissions counselor, call (208) 882-1566 or email info@nsa.edu.